We are seeing some frost injury to alfalfa leaves. 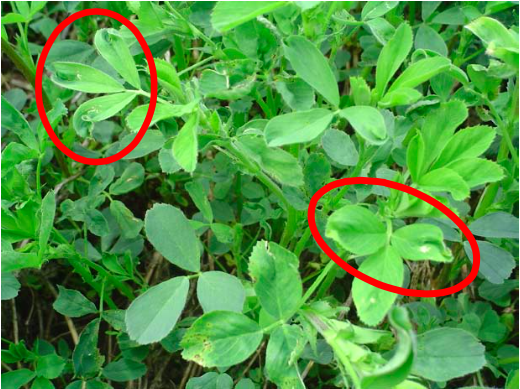 It appears as the misshapen leaf tips shown in the circles of the picture to the left. Frost can damage leaves in early stages of development and then damage becomes visible as the leaves mature. The frost injury is now becoming apparent. Usually only one or two sets of leaves are affected. Note that leaves on the stem above the misshapen leaves (which developed later) look normal. 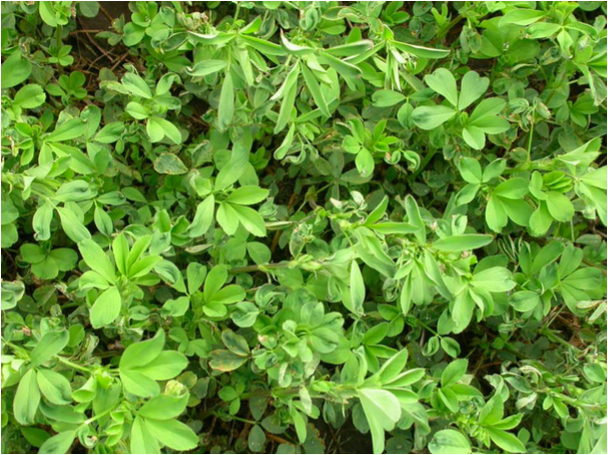 This frost damage will have little to no affect on the alfalfa. There is also some brown leaf spot on some of the leaves in the picture on the left. This, too, will likely be insignificant. If the leaf spot become more prevalent on the plant, it could be an indication of phoma and crown rot. The picture to right shows a slightly later stage where the next set of leaves have emerged since the frost damage occurred and do not show the wrinkling damage of the layer of leaves below. If you have questions, please contact Brian Hudelson at the Plant Disease Diagnostic Clinic (http://www.plantpath.wisc.edu/pddc/index.html).